I am a huge fan of Hayao Miyazaki. He's the Japanese animator who created the Oscar-winning Spirited Away. But Spirited Away is only one of many beautifully animated movies. 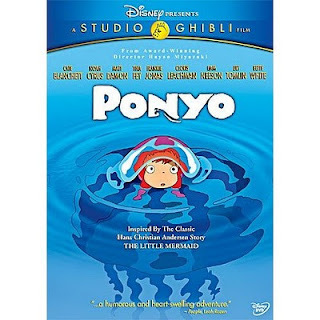 His latest work was Ponyo, about a magical goldfish who runs away from home and falls in love with a human boy. It's based on Hans Christian Anderson's The Little Mermaid. The voice over actors are wonderful: Tina Fey, Liam Neeson, Cate Blanchett, Matt Damon. The story is so much more creative than Disney's version. The music is also catchy. Seriously, you need to see this movie. It's for kids and there is nothing suggestive or scandalous in it. Plus, Ponyo is SO cute.